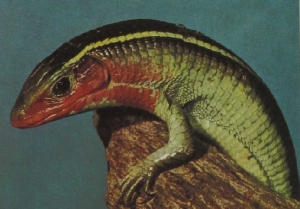 The gerrhosaurids are terrestrial lizards that range widely across Africa, occupying mainly savanna and open areas and not entering the forests. The group is represented on Madagascar. The Yellow-throated Plated Lizard is a bit over 1 8 inches long, lays eggs, and feeds mostly on arthropods. It is remarkably shy for such a large animal. The scales of its body are quite regularly arranged and each has a heavy bony core similar to that found in skinks. The armor is heavy and the scales interlock, providing a solid protection that probably deters the attacks of smaller enemies. This family again shows the common trend toward elongation, and some of the South African species have lost the front limbs.